IDK, there was something about that shopping trip that I just loved! I loved the hunt -loved looking through racks of clothes and not really knowing what I would find. Definitely a new hobby of mine! So today I’m sharing a few thrift store shopping hacks that’ll help you find some pieces you love without breaking the bank! New clothes are constantly being brought into thrift stores, so the more often you go, the more likely you’ll be to find those hidden gems. Clothes is also often rotated throughout the stores, so you might find something you simply missed the first time around. They say that stores usually spend the weekends preparing for new customers during the week, so I’ve heard that Mondays-Wednesdays are the best times to shop. That being said, every store is different, so just ask the staff what days they receive their new shipments so you know when the best time to shop is. Thrift store shopping requires a lot of patience and a bit of imagination, too. If you don’t have the time to go through racks of clothes and sort through a bunch of items, then maybe thrift store shopping isn’t for you. When I went, I wasn’t at all in a hurry and it paid off big time because I was able to really look through clothes and grab pieces that I loved. All thrift stores are organized differently, but a lot of them tend to have high-end/luxury/designer sections somewhere within the store. I recommend looking through those sections first. At the GoodWill I shopped at, I went straight for the designer section and I was shocked to see labels like Ann Taylor, H&M, Banana Republic, and Vineyard Vines. Even though you’re only paying a few dollars for this stuff, if you’re planning on wearing it, it needs to be in wearable condition, right? So before buying anything, look for stains, missing buttons, and pulled strings. If the item is damaged in any way but you’re still okay with buying it, ask for an additional discount, and more often than not, they’ll give it to you. At the end of each season, people tend to go through their closets and donate clothes they no longer need. When spring cleaning time comes around, people usually donate their winter gear they don’t need anymore, and at the end of summer, they get rid of all their warmer weather stuff. Point is, it’s a good idea to shop at thrift stores at the end/beginning of new seasons. I actually just scored a beautiful brand new (with tags) Ann Taylor sweater for $8. Way better than the $50+ I would have paid for it had I paid retail. Thrift stores usually have some kind of pricing system in place, but it might not always be obvious. That was the one downside to the GoodWill I shopped at. Nothing had tags with prices, so I had to ask the staff up front. Regardless, before you start browsing and grabbing things you like, figure out what their pricing structure is so you don’t get blindsided. For the longest time I thought that everything at thrift stores had to have been previously used. Turns out, a lot of items are donated to the stores brand new with tags! There’s nothing more exciting than snagging brand new items for pennies compared to what they retail for, so if you find any of these, buy them! Keep them for yourself or gift them to a friend. I know I wouldn’t care where it came from if I liked it! 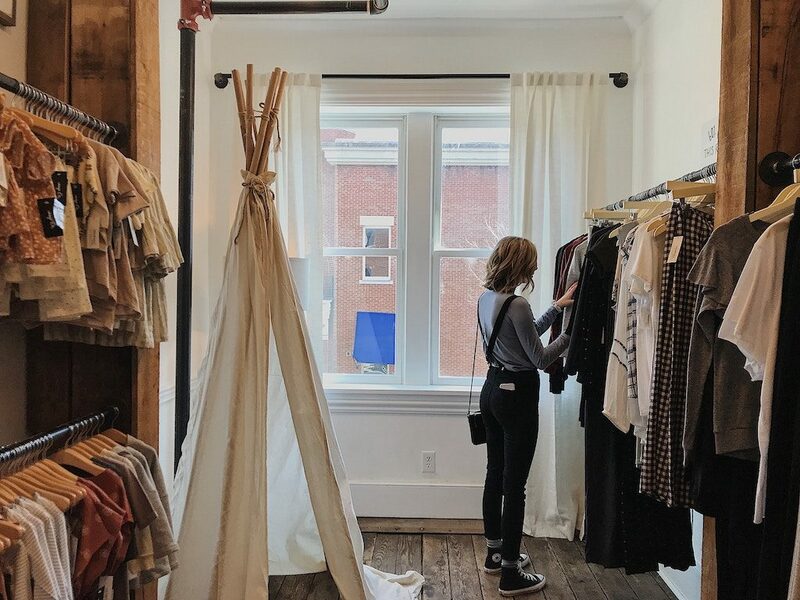 If you’re a fan of thrift store shopping but don’t have the time to actually go to a store, check out online websites like ThredUp. Although you can’t try on the clothes before you buy them (a super pet peeve of mine) you can still find a bunch of awesome designer clothes (some new with tags) for a fraction of retail price. Definitely worth checking out. So that’s it! Just a few thrift store shopping hacks to help you save cash on stuff you love! Any other tips? I’m obviously new at this and would love to know your secrets! Another tip I would recommend for thrifting clothing – try on EVERYTHING! Since you’ll be grabbing items from various different brands, designers, eras, and heck even countries, the sizing is going to be different for all of them. That cute mod dress from the 60’s might say size 11 but really fit like a modern size 2. You truly never know! I love Goodwill – the one I visit most frequently has an entire floor for their clothing section. I adore it!